1933-34 Series saw England visiting India for 3 tests and winning by 2-0. 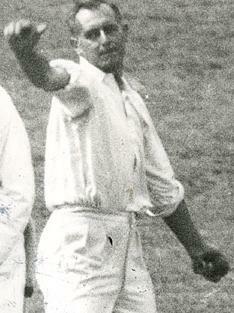 Verity, the slow arm orthodox bowler was the difference between two teams, besides the still-learning Indian batting. England sent full-strength team surprising many and making people believe that it was done with respect to game of Cricket. Probably they would have also taken into consideration the impressive dangerous bowling of Indian trio – Nissar, Amar Singh and Jahangir in the only test match they played before. India managed a draw against a strong English side and that was not less than an upset at that time. Walters (270), English Captain Jardine (221) and Lala Amarnath (203) were the only three batsmen of the series to cross 200-mark. While Valentine (179) was the only other prominent scorer from England, Vijay Merchant (178), Dilawar Hussain (160), and Captain Nayudu (160) contributed good scores to Indian total. English bowlers grabbed 58 wickets and Verity with 23 wickets emerged as the best bowler of the series. Indian bowlers grabbed only 39 wickets and Amar Singh with 14 wickets was the overall second leading wicket-taker of the series. Jardine continued his good run against India and scored 221, while CK Nayudu scored 160 runs.